Being a couple is special. You’re unlike any other couple. As a couple, you have secrets no one else knows, you have inside jokes that send you delirious with laughter, and you have pet names and private rituals. Defining who you are as a couple is an important part of bonding. Many couples feel as if it’s them against the world, and hardships strengthen their commitment to each other. 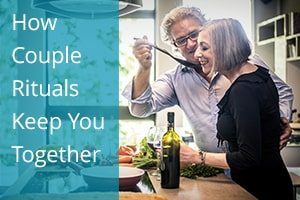 One of the best ways to create an unbreakable identity as a couple is to engage in rituals. You might have a special phrase that is nonsense to anyone but the two of you yet communicates a world of meaning when one of you says it. You might have a movie that means a lot to you as a couple that you watch regularly. You might have a special place you visit when you want to recapture the romance of your early days together. Still other rituals connect you in service to one another. Your partner might bring you coffee in bed every Saturday morning. You might make your partner’s favorite meal for his birthday each year. He might buy you the first bunch of daffodils when they start coming up in the spring. Although these rituals seem to be just a bit of fun, irrelevant to anyone other than the couple, they actually play an important role. They work as deposits in a couple’s “love bank,” storing up goodwill and positive emotions for the difficult times. For example, you may have just had an argument and you’re incredibly angry with each other, but then your song comes on the radio. You look at each other, remembering that you always dance to this song when you hear it. Do you dance this time? Chances are, you will…because it’s a ritual. It’s hard to be mad with someone your holding close. The ritual itself can restore the love. Dr. John Gottman, founder of The Love Lab at the University of Washington, found that every relationship needs a ratio of at least 5 positive and loving acts to every 1 negative or hurtful act. This magical ratio can predict which couples stay together. The more loving things you do, the more your relationship benefits. So how many couple rituals should you have? As many as you like! You can create rituals around the most minor things. Perhaps you light a candle each night at dinner. Perhaps you ask your partner what the best thing that happened to him that day was. Perhaps you share a bath together every so often, complete with glasses of bubbly and classical music. Holidays are a great time for rituals, so watch out for things you can enjoy year after year. Some rituals won’t last the test of time. You may try something, and your partner doesn’t like it. Other rituals may feel fun for a while but lose their appeal. That’s okay! Rituals should evolve and grow just as you do. If your relationship ever does end, you may find yourself missing the rituals more than you miss the man. Rituals provide structure and meaning in our lives. They give us little treats to look forward to. Even if you’re single, you can bring the power of rituals into your own life. Arrange a party with your girlfriends’ each Valentine’s Day. Treat yourself to a bunch of flowers once a week. Give yourself a life full of special things to look forward to. We don’t have a special song or date night or movie or anything like that. In fact, I can only think of 2 rituals that we have but they are big ones. The 1st is, as long as we both have time which happens 95% of the time, we cuddle for at least a few minutes first thing in the morning. The second is something that started 6 years ago the morning after our first date. Every day that we spend apart, one of us calls the other first thing in the morning & last thing at night to say good night. Even if he is just working late or just at a neighbor’s house less than a half of a mile away, I will call or text him to say good night. Most people think it is corny but to me, it is the definition of romance.